Have you been the victim of missed scaphoid fracture negligence? 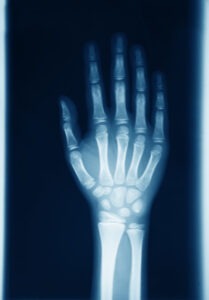 The wrist is made up of eight small bones, with the scaphoid bone being located nearest to the thumb. Due to its location and size, scaphoid fractures are the most commonly fractured bone. A scaphoid fracture is usually sustained by falling onto an outstretched hand, landing directly onto the palm but it can also be caused by a sporting accident or by being involved in a road traffic accident. Complete our Personal Injury Claim Form or telephone 01925 937070 for a free, no obligation of your missed scaphoid fracture negligence claim. Making a compensation claim with DSM Legal Solicitors is simple and hassle free. Our expert solicitors have the knowledge and experience to get you the compensation you deserve. We now also have a Wigan office which can be contacted on 01942 914004. However, unfortunately scaphoid fractures are often missed and this can have lasting and serious physical consequences. If a scaphoid fracture is diagnosed within four weeks, it should be treated by immobilisation in plaster for 6-12 weeks. If diagnosis is delayed, surgery is needed such as screw fixation, scaphoid debridement and bone grafting, and, even then, there is a risk that the fracture will not reunite. If a doctor negligently fails to diagnose a scaphoid injury at the first attendance, and does not request that the patient return within four weeks of the injury, then damages awarded in any medical negligence claim can be substantial. Why should I choose DSM Legal Solicitors for my missed scaphoid fracture negligence claim? Only an experienced, fully-qualified solicitor will handle your personal injury claim. We will keep you regularly updated. Our office in Warrington, Cheshire is easy to find – only minutes from junction 8 of the M62 – with free, on-site car parking. We also have disabled access including a lift and disabled toilets. Please email info@dsmlegal.co.uk to make an appointment or telephone 01925 937070 to speak to an expert personal injury solicitor. We offer ‘no win, no fee’ meaning that your claim is risk-free. We will fight to get you the best possible outcome of your missed scaphoid fracture negligence claim. We also advise on other types of Personal Injury Claims and Medical Negligence Claims – simply click on the links to find out more on how we can help you. Our office is in Warrington, Cheshire and we accept claims from across England and Wales. We are expert personal injury and serious injury solicitors. Speak to a solicitor for a free, confidential chat on 01925 937070 or complete the ‘Contact our Solicitors’ form at the bottom of this webpage. We can assist with personal injury (accident claims including fatality claims), medical negligence claims, road traffic accident accidents, employment law claims, wills and probate, oaths, affidavits and statutory declarations, lasting powers of attorney, settlement agreements, accidents at work, criminal injury compensation claims and professional negligence claims. At DSM Legal Solicitors we can assist you on a ‘no win, no fee’ basis meaning that if your case did not succeed we would not charge a fee. We handle claims quickly and efficiently and we keep you fully informed at all times.